“In the String Room” by dance professor Rebecca Nettl-Fiol features dancers moving in and out of string dropping from the ceiling. The dance examines shifting spaces and ambiguous borders, and it will be performed at February Dance: Designed Environments, presented by the University of Illinois dance department. CHAMPAIGN, Ill. — Audience members will use their cellphones to interact with dancers and the set during the premiere of “Critical Mass” at performances this week at Krannert Center for the Performing Arts. The University of Illinois dance department is presenting February Dance: Designed Environments at 7:30 p.m. Thursday, Friday and Saturday. “Critical Mass” looks at the nature of social media and the power of a critical mass to affect the outcome of a situation – for example, through a video going viral. 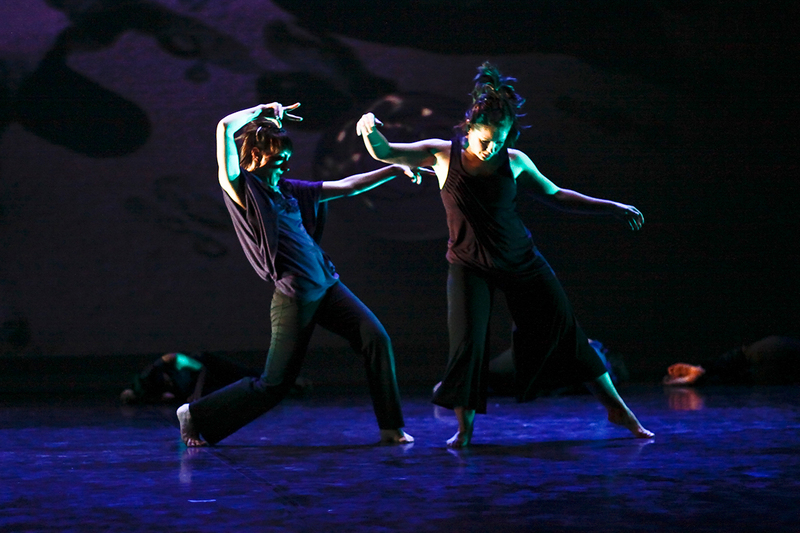 The dance incorporates technology, including a cellphone app through which audience members can interact with what is happening onstage, and motion sensors that trigger a response from the set and the dancers. John Toenjes, a composer and music director for the dance department and the founder and director of The Laboratory for Audience Interactive Technologies, created “Critical Mass” during a workshop last spring with visiting choreographer Chad Michael Hall. An early version of it was performed at Krannert Center in April 2016. The audience was able to walk onstage during that performance and interact with the set and augmented-reality pieces through the cellphone app. Toenjes modified the piece for its premiere at February Dance, as the audience will be seated. “I had to broaden how to include the audience in the environment,” Toenjes said. Some selected audience members will be invited onstage during February Dance, and others can use a phone app to hear some of the musical score played through the phone; to see lighting effects; to select which of four duets they like best; and to listen to dancers talk about their choreography. “A lot of people go to a modern dance concert and they’re mystified. This gives you a chance to know how choreographers came up with what they want to do,” Toenjes said of the dancers’ discussions that are available through the app. “We’re really experimenting with how cellphones can be used in a theatrical setting. It’s a delicate balance, because we don’t want people always looking at their phones,” he said. The set will feature a large cube with tablet computers on the sides, providing a view of the dancers inside through the computers’ cameras. A large-screen TV will supplement the view, until the dancers burst out of the cube. February Dance will celebrate the career of Renee Wadleigh, a dancer, choreographer and dance professor who recently retired from the dance department after 25 years of teaching. Wadleigh taught dance technique, choreography and contemporary directions. February Dance will feature one of Wadleigh’s works, “The Quench.” It explores memory and how past events affect the future. The performances will also feature “In the String Room” by dance professor Rebecca Nettl-Fiol. Dancers move in and out of string dropping from the ceiling. The dance examines shifting spaces and ambiguous borders, and how they affect the way we perceive movement. “Therapoda,” by graduate student Charli Brissey, considers the intersections of nature and culture, with landscapes that shift from Jurassic forests to surreal deserts to queer night clubs. February Dance: Designed Environments is the kickoff event for Sonic Illinois, a monthlong series of concerts to celebrate diversity in contemporary music in recognition of the U. of I.’s sesquicentennial. The dance performances by Toenjes, Wadleigh and Nettl-Fiol feature original music. Editor’s notes: To reach John Toenjes, email jtoenjes@illinois.edu. To download the cellphone app for “Critical Mass,” go to http://lait.ncsa.illinois.edu/get-the-lait-app/. For more information about February Dance: Designed Environments, contact Rebecca Ferrell at rferrel@illinois.edu or call 217-300-1193.